For Better or Worse? offers a fresh look at how professional campaign consultants have both positive and negative effects on democracy in the United States. 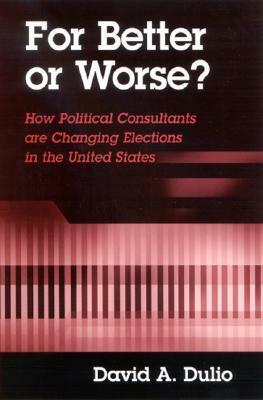 Questioning much of the prevailing conventional wisdom, David A. Dulio employs a unique set of data that empirically examines consultants own attitudes and beliefs to evaluate where they stand in modern democratic elections. Furthermore, he explores their relationships with candidates, voters, political parties, and the media, revealing that political consultants play an integral role in U.S. elections."